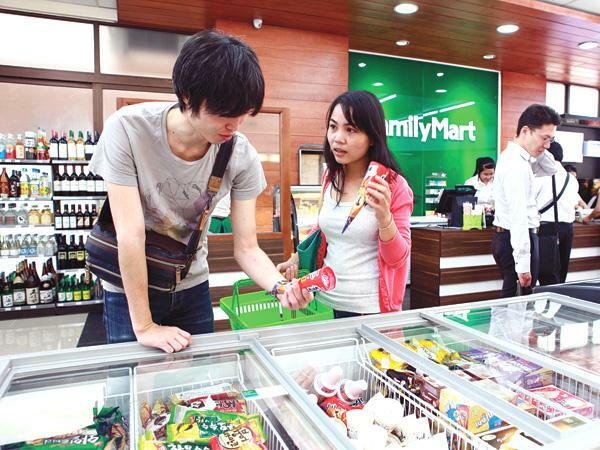 Japanese retailer FamilyMart has made a comeback in Vietnam’s retail market with its opening a Ho Chi Minh City-based store. The FamilyMart shop based on Sky Garden tower in Ho Chi Minh City’s District 1 resumed operation on July 30, 2013 after a time of cessation in operation due to the change of business partner. This is the first outlet marking the start of Japanese retail brand FamilyMart after bidding farewell to local distribution and retail firm Phu Thai Group JSC. The move shows the Japanese retailer did not have the intention to quit the Vietnamese market to cut down losses as it was once rumored after the collapse of the FamilyMart and Phu Thai joint venture. According to chairman and chief executive officer Kigure Takehiko of FamilyMart Vietnam Limited- the owner of FamilyMart stores in Vietnam- FamilyMart will open three more shops in Ho Chi Minh City this August and the number of shops would reach 20 by the year’s end. Besides, FamilyMart store system would deepen toes in Hanoi by late 2014. “We need time to forge ahead. Our target customers are pupils and students aged from 15-30. The forthcoming stores all target this same customer group,” said Takehiro, adding that the potential for convenience shop development in Vietnam was bigger than that of Thailand. Only District 1’s FamilyMart store, designated to serve Japanese customers living in Vietnam, mostly features Japanese brand essential goods. In parallel to reopening the shop system, FamilyMart also contemplates teaming up with another local partner to form a new JV for FamilyMart shop expansion. “The local partner should have a deep knowledge about local market, the ability to source space quickly as well as handle procedure issues,” said Takehiro. Its former local partner Phu Thai Group, however, after ‘splitting’ from FamilyMart has developed a new retail brand namely B’smart capitalised on its existing 42 shop system. The group was reported to tie up the knot with the Thai partner Beri Jucker Plc (BJC). Though Phu Thai Group has yet to unveil its new cooperation, the Thai partner BJC, through the Thai Corporation International Vietnam (under Mongkol Group and BJC), said in a recent media statement about its entrance into Vietnam’s retail market. The new B’smart brand retail chain’s chief executive officer of Thai nationality Phidsanu Pongwatana said 20 such shops would be opened in Ho Chi Minh City up to the end of 2013 to increase the total number of shops to 62. Besides, B’smart shops would make forays into Hanoi in the upcoming year. These shops would feature around 2,500 items part of them will come from Thailand. B’smart also mulls opening supermarkets, mega-supermarket, bookstores and drug stores.